This is a city of 100 000 in the Northeastern part of Bulgaria. It is a natural geographic center of the capitals and cultural centers of the old medieval Bulgarian Kingdoms - Pliska, Preslav and Madara. The city sprang from an old Roman and Byzantine fortress, overlooking a passage from the Danubian plain to the mountain passes of the Balkan mountain. Its location made it the cite of the largest Turkish garrison town during the years of the rule of the Ottoman Empire over nowadays Bulgaria. The largest mosque on the Balkan peninsula "Tombul Mosque" was built in the city in the 17th century. Shumen was a thriving economic and cultural center during the period of the Bulgarian National Renaissance ("Vuzrazhdane") in the 19th century. Shumen was the hometown of the first Bulgarian theater and the first Bulgarian orchestra. 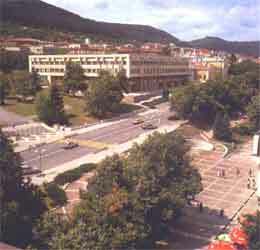 Today Shumen is the hometown of the "Konstantin Preslavski" University and the fourth largest public library in Bulgaria. Shumen formerly (1950-64) Kolarovgrad, also spelled SUMEN, town, northeastern Bulgaria. It lies in a valley in the eastern foothills of the Shumen limestone plateau. The town is a road and rail center with such industries as tobacco processing, canning and brewing, furniture making, and the manufacture of enamelware. Shumen also has a factory that makes farm-machinery components; founded in 1958, it was the first such factory in Bulgaria. Various crafts flourish, and agricultural activity is important. The local beer is widely acclaimed. Shumen has Thracian and subsequent Roman origins and was a fortress (founded 927) during the first Bulgarian empire. During Turkish rule (15th-19th century) it was a key Turkish fort. The Tombul Mosque, the largest in Bulgaria, was built in the mid-18th century.